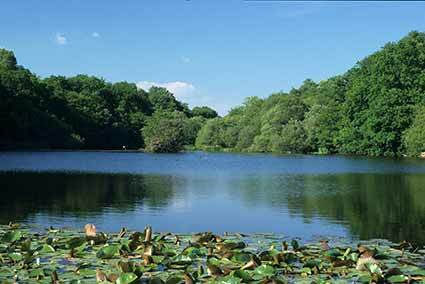 Eyeworth Pond, near Fritham in the north-east of the New Forest, is an idyllic beauty spot. Almost completely surrounded by trees, ponies drink at the water’s edge, ducks ate tame enough to feed almost from the hand, and wild birds come to visit, too. It is so easy to imagine William the Conqueror, soon after setting aside the lands of the New Forest for hunting, riding past this timeless scene. But that did not happen, for Eyeworth Pond was only created in the second half of the 19th century by the Schultze Gunpowder Company, an organisation that for many years had premises in the grounds of nearby Eyeworth Lodge. Work on the factory started in around 1860, although Captain Schultze, who lent his name to the enterprise, did not become involved until 9 years later. The remote New Forest location, surely out of keeping for such an endeavour, was selected to limit potential damage should unexpected explosions occur. A trade pamphlet published in 1896 notes that the Company employed upwards of 100 people in 60 buildings. The factory was sold just before the First World War, but continued in operation under new ownership until 1921. Little evidence of the factory survives, although the superintendent’s and gatekeeper’s houses remain, and so does the gravel track – the Powder Mill Road – leading out to the Cadnam-Fordingbridge road, built to avoid the need for the potentially deadly products to travel through the nearby village of Fritham. Look out, too, beside the car park entrance at the top of the hill leading down to the pond, for an old black, metal post box once associated with the factory. It was so placed to make the postman’s life easier in the days before motor vans! And, of course, there’s Eyeworth Pond itself. Created by damming a small stream, the pond was used as a reservoir to hold water needed during the manufacturing process – an estimated 27,276,540 litres (6 million gallons). Permission for the dam was first given in 1871, but when work started it was on a considerably greater scale than had previously been envisaged. New Forest commoners objected, and the Office of Woods, forerunners of the Forestry Commission, insisted upon conditions that were unacceptable to the company, so the project was halted. But following a fresh application in 1883, Gerald Lascelles, newly appointed as Deputy Surveyor of the New Forest, considered that the project would add to the beauty of the Forest, and recommended approval. He was, of course, absolutely correct, for the pond remains as an impressive landscape feature and wildlife habitat, popular with local residents and visitors alike.